Today you will learn How To Safely Flash /Install A Custom ROM Via TWRP Recovery Or CyanogenMod Recovery (CWM Recovery) On Any Android device. You can use this guide to install any other third party ROM (e.g: Carbon ROM, Chroma ROM and other AOSP ROM). So just follow the steps given below to Flash / Install A Custom ROM Via Recovery On Any Android devices. Note:- This guide is not for a single device. You can follow this guide to install / Flash any Custom AOSP ROMs On any android device having TWRP / CWM custom recovery on it. Make sure that you have the right ROM for your device.This is a very simple and easy process. Make sure your device’s bootloader is unlocked and your device has CWM / TWRP recovery. Then just flash the Custom ROM Zip file via TWRP / CWM recovery. Don’t worry we will be sharing all the steps so follow them carefully. → Before Flashing any ROM, we highly recommend taking a nandroid backup via TWRP recovery. 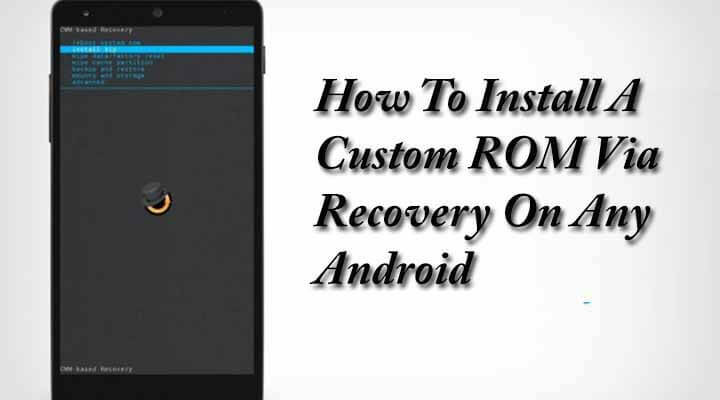 [How To to Boot Into Recovery Mode On Android (Various Ways) ##eye##]lect “Wipe” from TWRP main menu and do a “Swipe to Factory Reset” on the bottom of screen. Go back to TWRP main menu, tap on “Install” and select the ROM .zip file that you transferred to your device in Step 1. Now flash the Gapps file similarly like you flashed the ROM file. After flashing both ROM and Gapps, Reboot your device.